In her Feminist Responsibility Project (FRP), Beverly Semmes simultaneously conceals, reveals, and otherwise colorfully intervenes in pornographic scenes from vintage Hustler and Penthouse magazines. The exhibition also features Semmes’s striking work in other media: glass, ceramic, and video, as well as three of her signature dress pieces, including one acquired by the Faulconer Gallery in 2014. 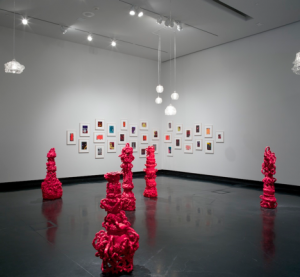 This exhibition is co- organized with the Frances Young Tang Teaching Museum and Art Gallery at Skidmore College.